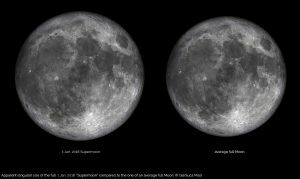 On January 1, 2018, New Year’s Day, the wolf moon will also be the first supermoon of the year. Supermoons occur when a full moon coincides with the time that the moon is closest to Earth. They don’t necessarily appear all that different from regular full moons, but this one is special because it’s one of three happening in a row – and the super blue moon on January 31 will also coincide with a lunar eclipse. New Year’s Eve often prompts people to gaze into the sky, whether it be for a fireworks display or simply to watch the big ball drop in Times Square, but the night of January 1st, 2018, will give you another reason to look up. 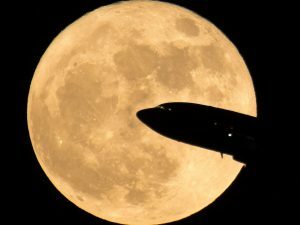 In a happy coincidence, New Year’s Day will feature a supermoon, which will appear bigger and brighter than a typical full moon. A supermoon is the term given to full moons which occur at the same time as the moon reaches its closest point to Earth in orbit. When that happens, the moon seems larger in the sky and also significantly brighter than it normally does. 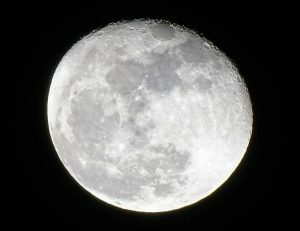 Only the most seasoned skywatchers would actually be able to notice the difference — supermoons are only around 7% to 14% brighter than normal, which is a relatively small increase — but it’s still a great opportunity for skywatchers to snap some photos and bask in the brighter-than-usual glow. When can you see the supermoon? The Wolf Moon will be at its peak at 9:24 p.m. EST. According to Time and Date, the moon will rise around 4:34 p.m. in the East-northeast corner of the sky. Since this moon is a supermoon, you won’t be able to miss it. It’s like when we get a food baby post-Christmas dinner, but are insanely content with the coma to come — the moon will be about 14 percent more bloated and about 30 percent more luminous. Quite the glow-up if you ask me. When the moon becomes “super,” it simply means that it is closer to the Earth during its orbit. The planets and moon have orbits shaped something like an oval, and when the moon comes over the horizon line it’ll share the sky with the sun for just a bit before lighting up our world more than before.